Starting today, you can broadcast your voice from your Assistant on your phone or voice-activated speakers, like Google Home. 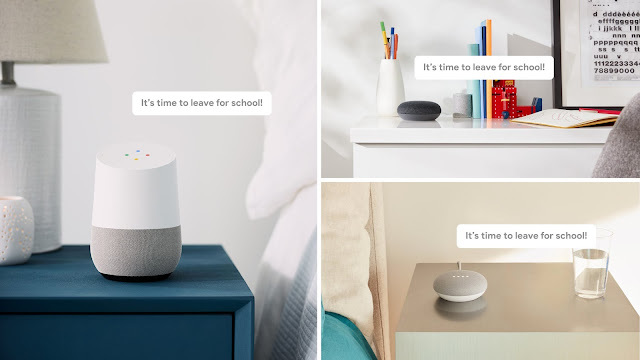 So when you need to round up the family in the morning, just say “Ok Google, broadcast it’s time for school!” and your message will broadcast to all Assistant enabled speakers in your home. For certain everyday things like waking up, dinnertime or settling down for bed, the Assistant can send a playful message on your behalf. Just say “Ok Google, broadcast it’s dinner time” and a dinner bell will ring on all your Google Homes. 🔔 Now you don't have to wear out your voice shouting up the stairs.